Chris B. Leyerle: What Word Goes with Farms and Bags? 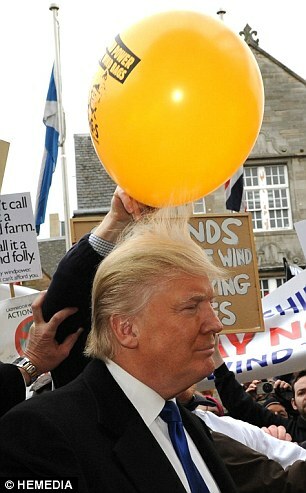 Trump flew into Edinburgh to expand on his feelings about wind farms to MSPs, telling them that the turbines - which he bitterly opposes - would be the 'destruction of your tourist industry'. 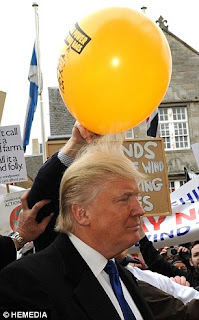 The protesters didn't agree, with balloons like the one rubbing up against Trump's famous comb-over covered with the slogan: 'Wind power, not wind bags'. Trump's shorts are in a twist because offshore turbines will, in his opinion, mar the view from the eponymous golf course he's erecting on the coast. Because, you know, these days things like affordable energy, manufacturing jobs and the destruction of the planet just aren't very important compared to wealthy tourists jetting around the world to play golf. Never mind that it is an activity with perhaps the largest negative environmental footprint of any leisure activity since Darth Vader toyed with vaporizing planets. One wonders why anyone takes him seriously. If you ever watched The Apprentice, and I don't recommend it, you'll see one of the most perverse and distorted representations of entrepreneurship available via mass media. Tired celebrities, Trump's toadies and center stage, of course, Trump himself, all vying to seem sagacious as they utter weighty soundbites that are to insight what the Idiot's Guides are to literature. Speaking to Scotland's legislators, Trump opined that the potential loss of tourism due to offshore wind development "is one of the most serious problems that Scotland will have or has had." In this, Trump perfectly articulates the prevailing attitude of the new global aristocracy: arrange what you do in a manner that welcomes us, and, if you have sufficiently pimped your community, your country, to our every whim, we will come and spend our ample leisure dollars with you. Apparently, the emerging global economy, per Donald Trump and his cronies, is one based not on the making of goods and services that improve the citizenry's quality of life, nor the building of sustainable manufacturing, nor one that promotes national competitiveness, but instead is one that caters to an ever-diminishing and imperious minority that expects obeisance to its every whim before their burgeoning discretionary largesse can be showered on the groveling serfs. Is this what is meant when pundits refer to a "service economy?" If so, this is servicing like that provided by fin de siecle brothels, where the many are prostituted to the increasingly depraved and degrading predilections of the few. Trump [was challenged to] produce 'clinical evidence' to support his views. 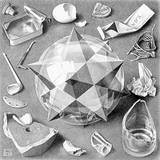 However, the American insisted: 'I am the evidence. I am an expert in tourism, I am considered a world-class expert in tourism, so when you say where is the evidence, I am the evidence. He said that without UK subsidies for the wind power developments, 'Scotland would go broke' funding them. Mr Trump argued: 'If you pursue this goal of these monsters all over Scotland, Scotland will go broke. I doubt he is any kind of tourism expert, but when it comes to going broke, Donald Trump is clearly world class.